There are so many great options – but whatever we decide to do, I know we’ll have fun just like we did last Saturday when we tackled the interior of the Dodge to see if could clean it up a bit. 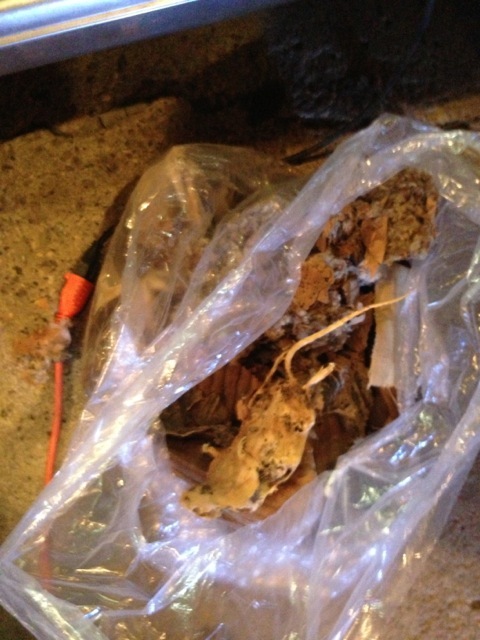 First off, Joel and I decided to take off the seat covers and see what was underneath. The fabric underneath (some people have suggested the fabric might be mohair) is a nice tan trimmed with a darker brown vinyl-type fabric. They really are nice looking, except for the fact that there are some rips and the fabric is so fragile that it rips easily. “Yep,” I replied over the roar of the shop vac. That surprised me a little. Removing the headliner was definitely on our to-do list but we hadn’t planned to do it that day. Then Joel pointed out something pretty obvious that we somehow missed. The headliner was sagging and it appeared to be sagging because it was full of stuff. 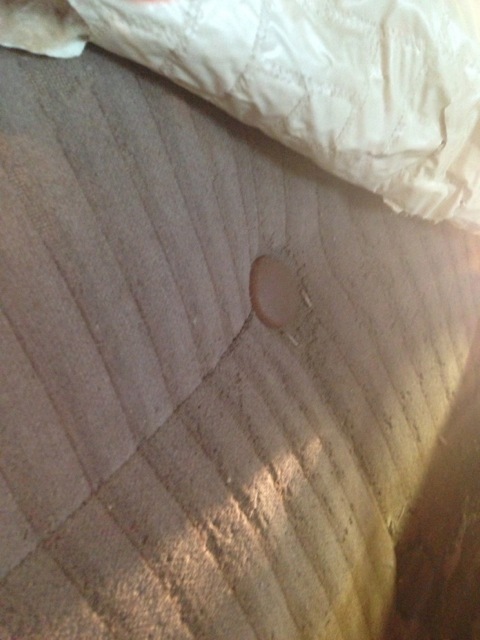 What kind of stuff was up in the roof of the Dodge we weren’t exactly sure but one thing did become clear – If we removed the headliner, whatever it was that was making the fabric sag was going to fall all over the seats we were carefully vacuuming. And we’d have to vacuum them all over again. 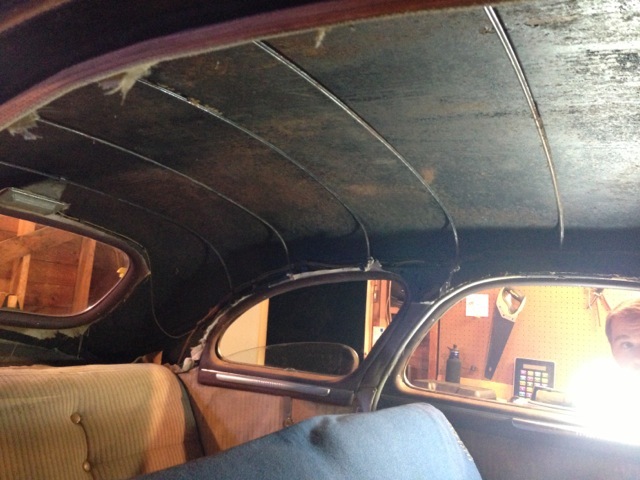 We quickly realized that it made good sense to remove the headliner right then. “Okay let’s do it.” I said. So we removed the front seat to save it from the stuff that was sure to fall. 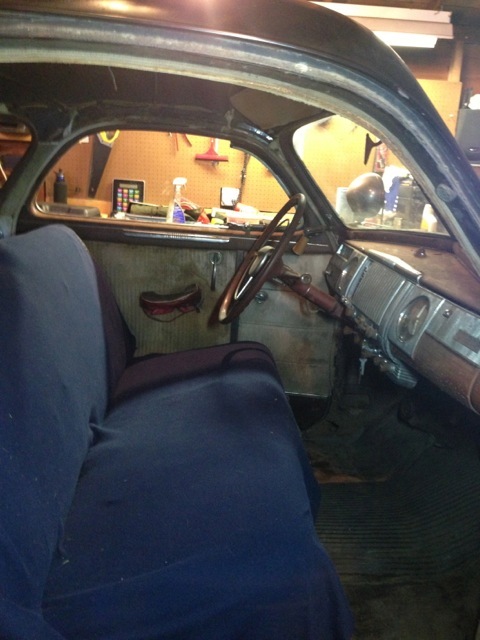 Then Joel got out his pocket knife, I took out my iPhone to video the process, and Joel made a swift cut to the headliner and….a massive explosion of stuff landed on the floorboards of the Dodge. For the next couple of hours, we continued to remove the headliner, saved swatches of the fabric, removed the scraps of stuff we found, did a lot of vacuuming, put the front seat back in and vacuumed some more. The Dodge looks much nicer now, and smells nicer, too, with the headliner and debris removed and a blanket thrown over the front seat. We know we’ll have to reupholster the seats at some time and replace the headliner. But, for now, we’re good to go. It’s the little things in life that excite me. Today, I bought the Dodge a brand new 6 volt battery. I eagerly raced home and wired it in… more on that in a minute. I have been systematically testing the electrical system for the last week with a dead 12 volt battery coupled with a battery charger in the place of a proper 6 volt. It created positive results. But today was different. In the last week, I have been lubricating the cylinders, hitting them with hammers, rocking the car and whatever else the internet(and good old fashioned real life people) had advised me to do. The engine was ready for a battery. So, when I finally wired that battery into the Dodge, I headed into the driver seat. I turned the key and reached my left hand towards the starter button. The engine turned over like a mad man. Electrical wizz bang, cylinders flying up and down. The majority of the valves doing what valves have to do. It was amazing. I knew from the get go that this engine would spin away, that somehow the last 20 years of it in storage didn’t matter. This is exactly what I hoped would happen, and it was such an accomplishment. This isn’t what made my day though. Because as I said before, it’s the little things in life that excite me. 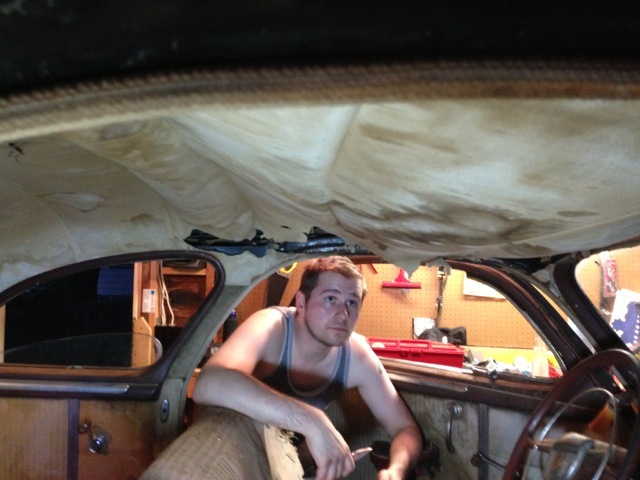 Late in the evening, after a lot of grinding, tinkering and general fun I took a moment to just sit inside the car. I turned the key to the on position again. And like a kid sitting behind the wheel of his parents car, I started flipping switches and pressing buttons. With a pull of a knob on came the heater fan. The heater fan? I had no idea the heater fan worked. I wondered what else suddenly started working with the addition of the proper battery. And there it was. A single knob to the right of the speaker, a knob without a name, a knob without a clear purpose. 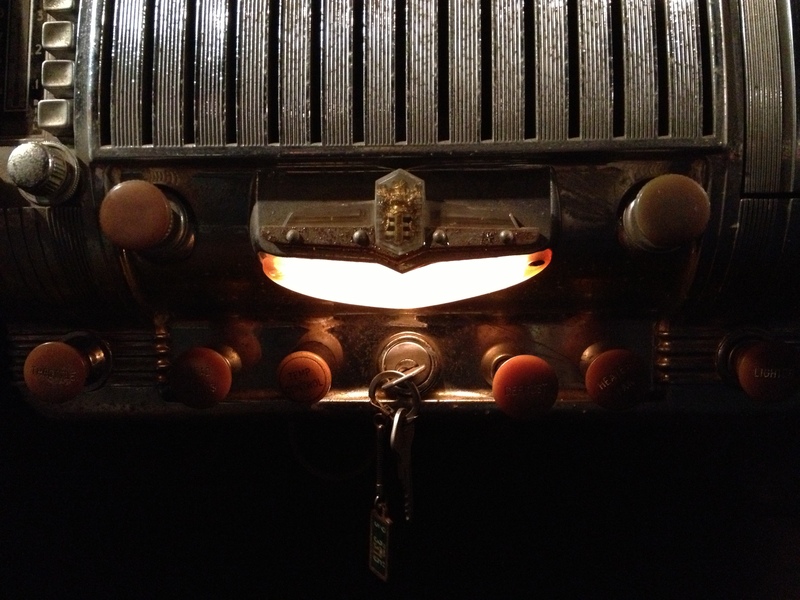 I twisted it, and on flipped the most spectacular dash light I have ever seen. I never paid attention to that part of the dash before, and I didn’t think I had any reason to look there before. But suddenly I noticed that I was staring at something so simple. Something so special. 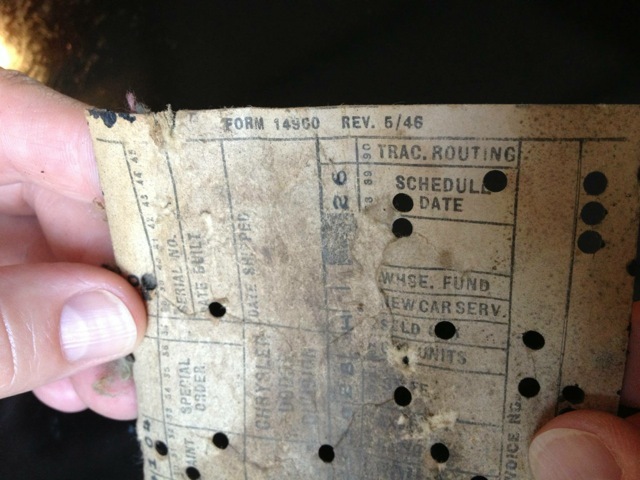 What other treasures are hidden in this car? Joel and I tackled the Dodge with a vacuum cleaner last Saturday in an effort to clear her (or is the Dodge a him? We haven’t decided yet) cleaned up a bit. One of the first things we did was open the glove box and look through the contents. 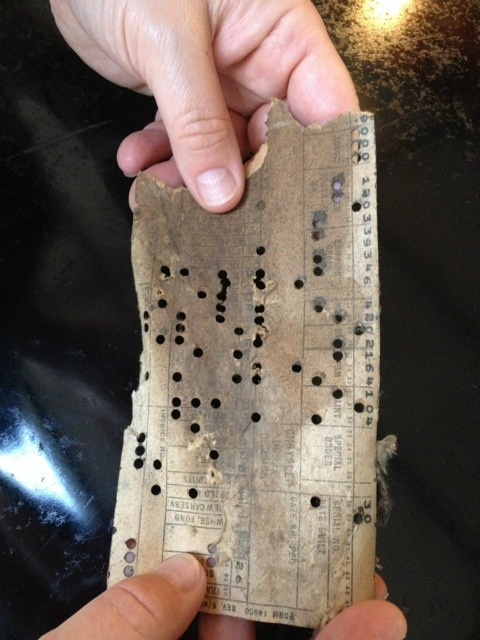 Inside we found a mysterious punch card. Upon closer inspection, we think we have an original card from the manufacture. But we’re not really sure. Across the top it says “FORM 14960” (or is it 14950?) and “REV. 5/46”. The punches correspond, more or less, with the numbers stamped across one side of the card. There are words like “Special Order” and “Schedule Date” and all sorts of punches. Most of the words are in pretty bad shape and we can’t fully decipher what they say. We have more than a few questions about what the card is all about. We saved the card and put it in a safe place, though, there’s no question about that! 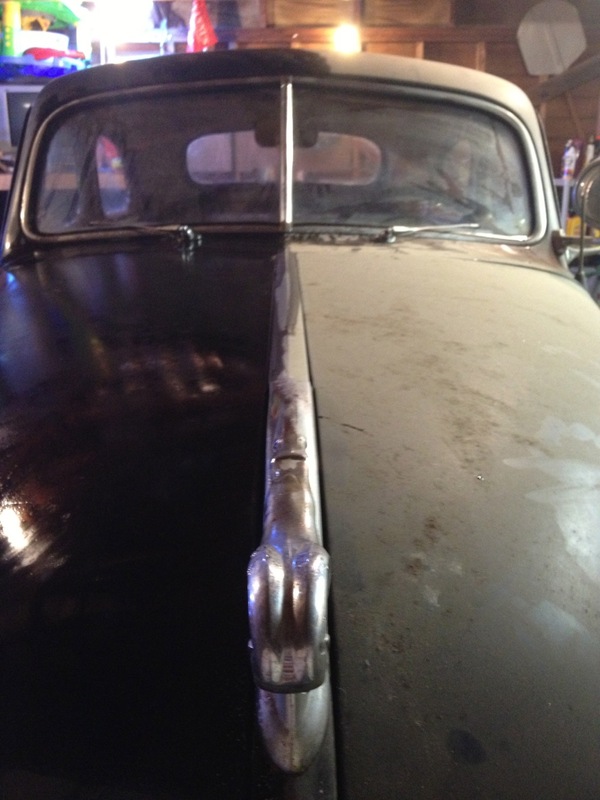 Last Thursday (August 22, 2013) we had the Dodge delivered to Joel’s garage in Minneapolis. By the time we got it tucked into the garage it was time for me to head home with my kids. As I suspected might happen, Joel got his son, Liam, to bed and then headed back out to the garage. He likes to detail cars and got right to work cleaning the dust off the Dodge. Look at what a little water and elbow grease will do – here’s a picture of the hood with one side still dust-covered and the other all cleaned up. Joel is going to be the main person working on the car so it makes sense to have it at his house. Trouble was, the Dodge was in our Uncle Marvin’s garage on a property in Oronoco, Minnesota and there was no way we could actually drive it to Joel’s house because the engine is stuck, among other things. We knew we needed to haul the Dodge to Joel’s somehow. But neither of us has a truck, let alone a dolly or trailer of any sort. So I started asking around to find out who could haul the Dodge for us. My first stop was to talk to Mark of Witt Bros. Auto Repair in Northfield. Actually, I need to go back in time a bit here first. When I first found out about the Dodge and wondered if we should buy it, I stopped in to Witt Bros. and asked Mark a bunch of questions about if buying the Dodge was a good idea and, if we did, what kind of work we could expect to put into it to get it running. Mark’s short answer was “It’s a done deal.” In other words, “yes, go buy the car, Myrna. It’s a good idea.” Mark and Mike (the Witt Brothers) have both been great help in listening to me talk about the Dodge and sharing information on restoration with me. They are good people. Back to hauling the Dodge. Mark told me that I should talk to John at Northfield Auto Care and see if he could haul the Dodge for us. So I stopped in and talked to John who said, yes, he could haul it for us using a dolly system (a tow-truck system where he lifts the front wheels up and puts the back two wheels on a four-wheel dolly so each back wheel is in a wheel-cradle of sorts, then pulls the vehicle behind his truck). So we set up a date and time for the pick up and delivery. And Joel cleaned out his garage to make room for the Dodge. Joel met Uncle Marvin last Thursday (8/22/13) at Marvin’s garage. I stayed at Joel’s house with his son and my two kids. Joel said John obviously knew his stuff and he got right to work getting the Dodge on the dolly and started off to Minneapolis. Sadly, on the drive home, one of the already loose side vent windows flew out and smashed on the road. But oh well. We were going to replace it anyway. It was dark by the time Joel got home. John was minutes behind him and drove around to the alley. He backed the Dodge into the garage perfectly – he’s obviously a pro at what he does and was very nice to work with. Shortly after unloaded the Dodge, a neighbor of Joel’s showed up to see the Dodge. I commented to John that the Dodge was attracting attention. His response was that, yes, people love old cars and we can expect a lot of visitors from here on out. Here’s a bunch of pictures of the Dodge getting hauled home. Click on any image to view full size or to view in a slide show.